The knee joint is consists of the lateral femorotibial , medial femorotibial , and femoropatellar joints. It is is the largest and most complex joint of the body. It is a compound synovial joint incorporating two condylar joints between the condyles of the femur and tibia and one saddle joint between the femur and patella. The femoral condyles articulate with the tibia condyles below and behind, and with the patella in front. The distal end of femur ends in two condyles and articulates with the respective tibial condyles and patella. The tibia articulates with the distal lateral and medial femoral condyles. The distal part of the knee joint is formed by the proximal end of the tibia. It also has medial and lateral condyles and intercondylar areas. The fibula does not articulate with the femur or patella and is not part of the knee joint. Menisci [singular – Meniscus] are crescentic, fibrocartilaginous discs that attach to the intercondylar area and periphery of the tibial plateau. Two borders – Outer border is thick, convex and fixed to the fibrous capsule, inner border is thin, concave and free. Two surfaces – The upper surface is concave for articulation with the femur. The lower surface is flat and rests on the peripheral two-thirds of the tibial condyle. The peripheral thick part is vascular. The inner part is avascular and is nourished by synovial fluid. The medial meniscus is nearly semicircular and is wider behind than in front. The posterior fibers of the anterior end are continuous with the transverse ligament A ligament that joins both the menisci]. Its peripheral margin is adherent to the deep part of the tibial collateral ligament. The lateral meniscus is nearly circular. The posterior end of the meniscus is attached to the femur through two meniscofemoral ligaments. It is separated from fibular collateral ligament by the popliteus tendon and the capsule. The medial part of the tendon of the popliteus is attached to the lateral meniscus which along with the two meniscofemoral ligaments makes this meniscus mobile. Menisci deepen the articular surfaces of the condyles of the tibia and partially divide the joint cavity to upper and lower compartments. Flexion and extension of the knee take place in the upper compartment, whereas rotation takes place, in the lower compartment. They help to make the articular surfaces more congruent. Because of their flexibility they can adapt their contour to the varying curvature of the different parts of the femoral condyles, as the latter glide over the tibia. The joint capsule consists of the external fibrous layer and the internal synovial membrane. The fibrous layer is thin, except for the thickened parts that make up the intrinsic ligaments of the knee. It encapsulates the knee joint while at the same time making an adjustment for the important structures. It is attached about 0.5-1 cm beyond the articular margins on femur and tibia both. It is deficient anteriorly, where it is replaced by the quadriceps femoris, the patella, and the ligamentum patellae. laterally, it encloses the origin of the popliteus. Posterolaterally, there is a gap behind the lateral condyle for passage of the tendon of the popliteus. The part of the capsule between the menisci and the tibia is sometimes called the coronary ligament. Short lateral ligament is a cord-like thickening of the capsule deep to the fibular collateral ligament extending the medial border of the apex of the fibula to the lateral epicondyle of the femur where it blends with the tendon of the popliteus. Another for the exit of the tendon of the popliteus. Sometimes there are gaps that communicate with the bursae deep to the medial head of the gastrocnemius, and deep to the semimembranosus. The synovial membrane of the knee joint lines the capsule, except posteriorly where it is reflected forwards by the cruciate ligaments, forming a common covering for both ligaments. In front, it is absent from the patella. Above the patella, it is prolonged upwards for 5 cm or more as the suprapatellar bursa. Below the patella, it covers the deep surface of the infrapatellar pad of fat, which separates it from the patellar ligament. A median fold, the infrapatellar synovial fold, extends backward from the fat pad to the intercondylar fossa of the femur. An alar fold diverges on each side from the median fold to reach the lateral edges of the patella. Image Credit: Taken from web, multiple versions of were available, no authentic one source could be traced, Used under FUP. Oblique popliteal ligament and arcuate popliteal ligament. 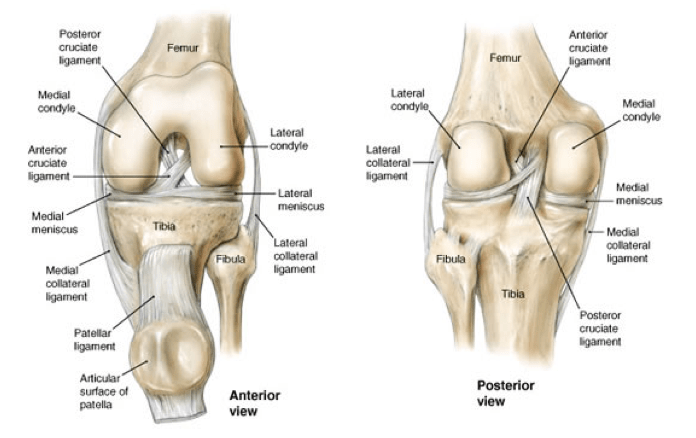 The patellar ligament is the anterior ligament of the knee joint. It is the distal part of the quadriceps tendon and attached to the tibial tuberosity. The vastus medialis and lateralis contribute to the patellar ligament medially and laterally through the medial and lateral retinacula, which make up the joint capsule of the knee on either side of the patella. The ligamentum patellae is about 3 inches long and one inch broad. It is attached above to the margins and the rough posterior surface of the apex of the patella, and below to the smooth, upper part of the tibial tuberosity. The retinacula also maintain alignment of the patella relative to the patellar surface of the femur. Also called tibial collateral ligament, this ligament is superiorly attached to the medial epicondyle of the femur just below the adductor tubercle. Inferiorly, it divides into anterior and posterior parts. The anterior (superficial) part is about 4 inches long and half an inch broad, and is separated from the capsule by one or two bursae. It is attached below to the medial border and posterior part of the medial surface of the shaft of the tibia. It covers the inferior medial genicular vessels and nerve, and the anterior part of the tendon of the semimembranous, and is crossed below by the tendons of the Sartorius, gracilis and the semitendinosus. The posterior or deep part of the ligament is short and blends with the capsule and with the medial meniscus. It is attached to the medial condyle of the tibia above the groove for the semimembranosus. Morphologically, the tibial collateral ligament represents the degenerated tendon of the adductor magnus muscle. Also called fibular collateral ligament, this ligament is strong and cord-like. It is about two inches long. Superiorly, it is attached to the lateral epicondyle of the femur just above the popliteal groove. Inferiorly, it is embraced by the tendon of the biceps femoris and is attached to the head of the fibula in front of its apex. It is separated from the lateral meniscus by the tendon of the popliteus and the capsule. The inferior lateral genicular vessels and nerve separate it from the capsule. Morphologically, it represents the femoral attachment of the peroneus longus. The lateral collateral ligament also splits the tendon of the biceps femoris into 2 parts. The oblique popliteal ligament and arcuate popliteal ligament reinforce the joint capsule on the posterior aspect. The oblique popliteal ligament is an expansion of the tendon of the semimembranosus. It arises from the medial tibial condyle and passes toward the lateral femoral condyle, where it blends in with the rest of the joint capsule and is attached to the intercondylar line and lateral condyle of the femur. It is closely related to the popliteal artery and is pierced by the middle genicular vessels and nerve, and the terminal part of the posterior division of the obturator nerve. The arcuate popliteal ligament is a posterior expansion from the short lateral ligament. It extends backwards from the head of the fibula, arches over the tendon of the popliteus, and is attached to the posterior border of the intercondylar area of the tibia. The anterior cruciate ligament begins from the anterior part of the intercondylar area of the tibia, runs upwards, backwards and laterally, and is attached to the posterior part of the medial surface of the lateral condyle of the femur. It is taut during extension of the knee. The posterior cruciate ligament begins from the posterior part of the intercondylar area of the tibia, runs upwards, forwards and medially, and is attached to the anterior part of the lateral surface of the medial condyle of the femur. It is taut during flexion of the knee. The cruciate ligaments are supplied by vessels and nerves which pierce the oblique popliteal ligament. Synovial fluid originates from plasma that is filtered by the capillary net and diffuses into the knee along with hyaluronic acid, which is locally synthesized. Synovial fluid helps in nourishment and provides a line of defense to the joint. Many bursae surround the knee and the arrangement is complex and variable. As many as 13 bursae have been reported around the knee joint. Anserine bursa- The anserine bursa is located 4-5 cm distal to the anteromedial joint line and deep to the pes anserinus, the conjoint tendon formed by the sartorius, gracilis, and semitendinosus tendons (see the following image). Deep to the anserine bursa is the insertion of the MCL. Semimembranosus bursa – The semimembranosus bursa is located in the popliteal fossa and commonly causes posterior swelling of the knee joint secondary to degeneration within the knee joint. Middle – Popliteal vessels, tibial nerve and middle genicular vessels and nerve in the middle. Posterolaterally – Lateral head of gastrocnemius, plantaris and common peroneal nerve. Posteromedially – Medial head of gastrocnemius, semitendinosus, semimembranosus, gracilis and popliteus. Inferior medial genicular vessels and nerve. Inferior lateral genicular vessels and nerve. Circumflex fibular branch of the posterior tibial artery. The anastomosis supplies the patella, the femoral and tibial condyles, bone marrow, articular capsule, and synovial membrane. The venous system of the knee joint is primarily composed of the popliteal and femoral veins. These veins simply run with their corresponding arteries and drain deoxygenated blood from the arterial anastomosis..
Femoral nerve, through its branches to the vasti, especially the vastus medialis. Sciatic nerve, through the genicular branches of the tibial and common peroneal nerves. Obturator nerve through its posterior division. Infrapatellar branch of the saphenous nerve provides cutaneous sensation to the medial anterior aspect of the knee. Peripatellar plexus is composed of branches from anterior cutaneous branches of the femoral nerve and the lateral femoral cutaneous nerve to provide cutaneous sensation to the rest of the knee. Active movements at the knee are flexion, extension, medial rotation and lateral rotation. Flexion and extension are the chief movements. These take place in the upper compartment of the joint, above the menisci. The transverse axis around which these movements take place is not fixed. During extension, the axis moves forwards and upwards, and in the reverse direction during flexion. These movements are invariably accompanied by rotations called conjunct rotation. Medial rotation of the femur occurs during the last 30 degrees of extension and lateral rotation of the femur occurs during the initial stages of flexion. When the foot is off the ground, the tibia rotates instead of the femur, in the opposite direction. Rotatory Movements at the knee are of a small range. Rotations take place around a vertical axis and are permitted in the lower compartment of the joint, below the menisci. Rotatory movements may be combined with flexion and extension (conjunct rotations), or may occur independently in a partially flexed knee (adjunct rotation). The conjunct rotations are of value in locking and unlocking of the knee. Locking is a mechanism that allows the knee to remain in the position of full extension (as in standing) without much muscular effort. Locking occurs as a result of medial rotation of the femur during the last stage of extension. The locked knee joint can be flexed only after it unlocked by a reversal of the medial rotation i.e., by lateral rotation of the femur. Unlocking is brought about by the action of the popliteus muscle. Some separation of the tibia from the femur. Biceps femoris, semitendinosus semimembranosus as principal muscles. Gracilis, Sartorius, politeus and gastrocnemius act as accessory muscles. Quadriceps as principal muscle and tensor fascie latae assisting it. Popliteus, semimembranosus and semitendonosus as principal muscles. Sartorius and gracilis act as accessory muscles. Structurally, the knee is a week joint because the articular surfaces are not congruent. The tibial condyles are too small and shallow to hold the large, convex, femoral condyles in place. The femoropatellar articulation is not inherently stable because of shallow articular surfaces, and because of the outward angulation between the long axis of the thigh and of the leg. Cruciate ligaments – maintain anteroposterior stability. Collateral ligament – maintain side to side stability. Iliotibial tract plays an important role in stabilizing the knee. The angle between the long axis of the thigh and that of the leg is called Q angle. It is about 13 degrees with a slight variation on either side. This is how leg and thigh align with each other. However, many reasons can alter that alignment resulting in deformities at the knee. Many diseases like rickets, bad posture, or congenital abnormality can cause that. Genu Varum or bow legs is a deformity that causes angulation of the leg in relation to the thigh. Usually, medial angulation of both femur and tibia is involved. Genu valgum or “knock knees” is a lateral angulation of the leg in relation to the thigh. This deformity is opposite of genu varum. Young children can have physiological valgus or varus. The knee joint may be affected by various diseases. This includes osteoarthritis and various infection. Knee effusion may occur as a result of the disease process. Bursae around the joint may get filled with fluid resulting in swellings. Meniscal tears may be produced by Injuries to menisci are commonly produced by the twisting strains in a slightly flexed knee, as in kicking a football. The medial meniscus is more vulnerable to injury than the lateral meniscus because of its fixity to the tibial collateral ligament, and because of greater excursion during rotator movements. The lateral meniscus is protected by the popliteus which pulls it backward so that it is not crushed between the articular surfaces. Injuries to cruciate ligaments are also common. The anterior cruciate ligament is more commonly damaged than the posterior. It may be injured in violent hyperextension of the knee or in anterior dislocation of the tibia. The posterior ligament is injured in posterior dislocation of the tibia. Injuries to collateral ligaments can also occur.